Second, it was at The Bridge Theatre, the new theater right next to Tower Bridge, in which I had already seen Young Marx with Rory Kinnear and which is just too beautiful to resist. Third, there were quite cheap „Promenading tickets‟ in the „Pit‟, which is why I thought Friedlvongrimm, who was going to join me on my trip, first and foremost to see the Broadway musical sensation Hamilton, might be happy to come along. Plus, being in the pit sounded intriguing and quite fitting for a play featuring the Romans. But I couldn’t have imagined quite what an impact that play would have on me. Since I saw, nay experienced the play four times from the pit, it is a bit difficult to keep all my memories apart. I’m mainly going to give an account how the first time hit me and how I felt the subsequent times. The performance has a quite unusual pre-show (at least that’s what it felt like the first time, afterwards it became clear it was actually already part of the performance) for a Shakespeare play: In the middle of the pit, there is a small stage on which we spot a simple drum set, some mics, two amps for guitar and bass. I knew there would be a band, but I wasn’t quite sure why… The whole place seemed ready for a rock concert, there were people who sold buttons and baseball caps, others sold drinks, not exactly what you’d expect from a Shakespeare play. Then again, it actually fits perfectly and gets the crowd exactly into the right mood. The first time we position ourselves right at the edge of the stage (next to where the guitar player would stand), which, in hindsight, wasn’t the best idea, both regarding the sound (I did not hear the singer’s voice, as I mainly got blasted away by the amp of the guitar) and where we ended up later when the play started and new stages appeared out of the ground. But it is a perfect spot to get a good look at the band members: closest to us, Zachary Hart on the guitar, then there were Fred Fergus on the drums, Kit Young on the bass and Abraham Popoola on the vocals. This was actually taken during my second time. And I love watching the other audience members, too: There are some young girls (17-18 years old?) who enthusiastically sing along, a father (about my age maybe) who clearly enjoys himself while his teenage daughter looks quite unimpressed, and simply people of all ages and backgrounds. It feels like a crowd that Shakespeare would have wanted to be there. I already love the play. The set list: „Rock’n’Roll Star‟, „Roar‟ (yes, by Katy Perry! 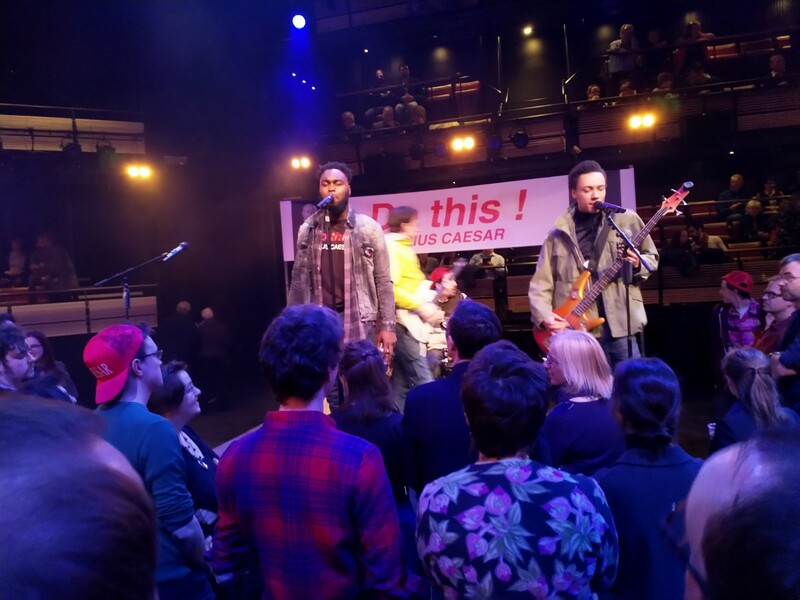 ), „Eye of the Tiger‟ – when suddenly Mark Antony (David Morrissey) in a track suit storms the stage and makes the whole audience clap along and cheer (including those sitting in the galleries) -, „Seven Nation Army‟ and „We’re not gonna take it‟. The „mob‟ is ecstatic, so it isn’t difficult to make us all boo when someone cuts off the electricity of the band and wants to send us all home. We realize, Ah, this is already part of the play! And more than willingly we join the band in their „Caesar! Caesar‟ chants. I’m already completely and utterly enthralled! But what’s happening now? People are shouting at us „Back! Back! Move! Move!‟ Lo, and behold: the stage rises from the ground, and we also have to make way for Caesar (David Calder) and his people, and I’m just like: Whoah! When the stage has come to its final height, we are allowed to step right next to it. But I’m beginning to realize that this won’t be the last time that we have to move. The whole logistic and technical aspects of this production keep me quite occupied and I sometimes have difficulty concentrating on the actors who are speaking. I keep thinking: That’s so awesome how they DO this! Especially until Caesar’s assassination, some lines get lost for me while I’m looking at other things, the audience or other actors who are not currently in the spotlight but are still fully immersed in their characters. The first time I get a little emotional is when Portia (Leaphia Darko) appears on stage. She feels terribly neglected by her husband Brutus (Ben Whishaw) and her despair is palpable. But Brutus remains absent, cannot bring himself to tell her what he, Cassius (Michelle Fairley) and the others are up to. Then comes the day of the assassination – when the first shots are fired (this is a modern production, thus guns instead of knives), Caesar’s security men (some of them formerly seen on stage as the band members) shout at us „Get down! Get down!‟ just like in real life. Everyone is cowering on the ground while watching the last breaths of Caesar and his words „Et tu, Brute?‟ My heart is beating fast and I marvel, once again, at how brilliant this producion is. What follows are two breathtaking speeches at Caesar’s funeral: One by Brutus, containing one of my favorite lines „Not that I loved Caesar less, but that I loved Rome more.‟ He is clearly a charismatic speaker and seems to convince the crowd (many actors have now integrated into the crowd and keep playing from there shouting comments, agreeing, disagreeing – it’s amazing to have people directly behind you suddenly shouting a comment). But then Mark Antony is allowed to speak, and, while he says that he is not a great speaker like Brutus, he sways the mob by speaking from his heart. I’m very close to him when he keeps speaking from Caesar’s coffin and hands around Caesar’s blood-stained vest – I even hold it in my hands. Close to us, during all of these speeches, stands Zachary Hart, formerly known as the guitarist, mourning. His eyes are sad and red, he is completely in his role and it breaks my heart to watch him. This is acting at its best! Acting while everyone is focused on those in the spotlight. I was deeply impressed (and was so lucky to be able to tell him that more than a month later). 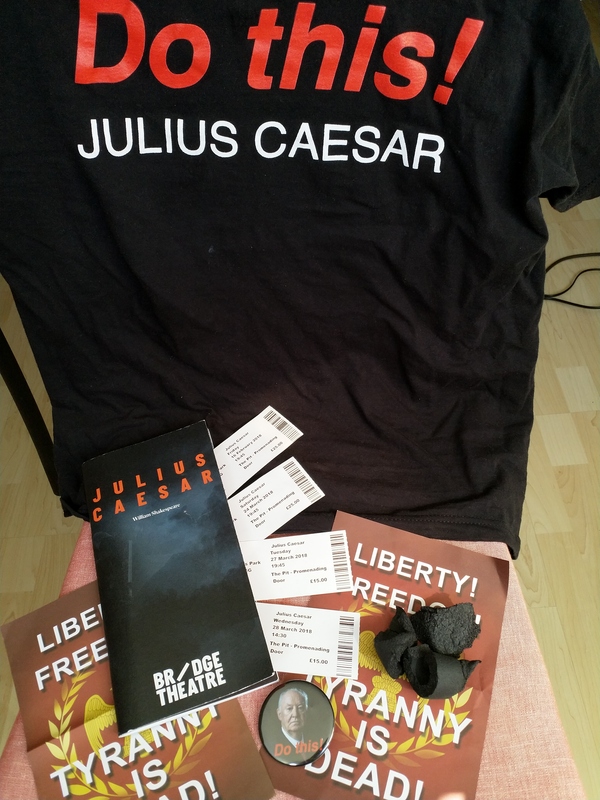 Things get out of hand after Caesar’s burial: a civil war breaks out – and suddenly there are gunshots all around us, fires are burning, it „rains down‟ debris (I took a few souvenirs, see the first photo) and ashes onto the stage parts. We’re in the middle of a war zone. It would be chilling if I wasn’t so amazed by how they managed to pull this off. I’m fascinated but not wholly IN the play (that will come on my later visits). When all of Caesar’s assassins are dead and the play ends with a great victor’s pose by Caesar’s heir Octavius (Kit Young), the crowd erupts into applause and cheering that would be worthy of any rock concert. I see glowing faces all around me. When the „security people‟ who have moved us all around throughout the play get on stage, they get a big round of applause as well – so very well deserved!!! I’ve felt so inspired and full of energy, my love for theater lifted to a whole new level since then. So what I did on my way home – while still at Heathrow Airport – was buy a ticket for my next trip to London im March. And then I told the drama group and the 13th graders that I teach English about my experience and invited them to come along to the NT LIVE broadcast. Not all of them came along in the end, but, all in all, it was about 24 students and one colleague. Still, the broadcast – shown here with subtitles – helped me to focus on the dialogues and monologues without being distracted by what was going on around me. The subtitles were extremely helpful, too, so that I could really memorize some of the lines and felt like understanding the play now completely. Of course, my students (and my colleague, who does not have as much practice in English) found the language really difficult, even the best of my students struggled with Shakespeare’s English. But even so, they were impressed by the production and the actors‘ performances. Some of the students from the drama group were really enthusiastic afterwards, one girl told me a few days ago that she had researched the play and The Bridge Theatre because she wanted to know more about it. Mission accomplished! Why I ended up seeing the play not only one but three more times, can be read in Many Meetings #1 and #2. Now, the main question for me was, would I be able to focus more on the acting than on the technical aspects of the production while experiencing it for the second time from the pit? I was. Knowing a bit better where to stand in the concert to get a good spot afterwards, led me to always being right next to the stage in the first row, being as close to the actors as I’d ever been anywhere anytime before. This exhilarated me and kept me involved even more than the first time round. Now I started to appreciate the actors‘ performances even more. The choice to give Cassius a different gender and have her played by Michelle Fairley works perfectly. I must admit that I haven’t read the play nor had I seen another production before, so I can’t compare her performance to any other. I did like her emotional performance a lot – it brought me close to tears a number of times, most notably when she and Brutus meet for the last time and he denies her a hug. That hurts her so deeply and I could completely empathize with her. A truly mesmerizing performance! As I now saw David Calder’s Caesar a lot better than the first time, I fell completely under his spell. David Calder is a god of acting! I could just watch his face for hours on end and it would keep me utterly enthralled. It is the first time that I saw him live on stage and I’m in awe of his greatness. I can’t put this in less cheesy-sounding words. Ah, David Morrissey! How I hated him as The Governor in The Walking Dead, to the point that I could not really separate the man from the role anymore. I even decided not to go see the NT LIVE broadcast of Hangmen (stupid me!!!) because I thought I couldn’t stand watching him for such a long time. Well, as I told David in the foyer after my third time, he’s cured me of my hatred of him. He’s incredibly good as Mark Antony, his best moments when he’s mourning Caesar. Bravo! Possibly my favorite of all of them because she made me laugh every single time: Adjoa Andoh as Casca. The way she delivered her lines was so decidedly un-Shakespeare-like that I wanted to cheer every single line of hers! I’m glad I got the chance to tell her that in person. Even a single „No!‟ would elicit the audience’s laughter! But also those with smaller roles kept me captivated. I have a particularly soft spot for the band members. Fred Fergus is simply adorable as Lucius, he sometimes seems a bit clueless but then again he is the most loyal of Brutus‘ friends – literally till death. What made me appreciate Fred’s performance was especially a scene in which Brutus tells Cassius about the death of his wife Portia. Lucius is eaves-dropping and slowly falls apart as Brutus mentions (not in name but it is clear he means Lucius) that Lucius wasn’t there to prevent her from killing herself (the way I understood this line: „And, her attendants absent, swallow’d fire‟). In my second, third and fourth viewing I always ended up opposite Lucius in the scene and could never resist watching him becoming increasingly sad and despaired – while everyone else in the audience was watching Brutus and Cassius. (As a side note: Michelle Fairley is also fantastic in that scene!) And then: He sings himself to sleep! How can you not love this character? The other members of the band also did a marvelous job: Kit Young’s reaction as Octavius to Mark Antony touching his arm as if they were buddies and his final victory pose are something to remember, and Abraham Popoola’s deep voice and imposing figure as Trebonius were very impressive. Leaphia Darko has only that one scene as Portia, but she absolutely nails this scene, as I’ve mentioned earlier (she later appears as a citizen of Rome), Wendy Kweh as Calpurnia shines in her big scene with Caesar (she later is Varro in Brutus‘ army), Leila Farzad’s big moment as Decius Brutus is in the same scene, when she convinces Caesar in a quite seductive way that Calpurnia’s nightmare of the Romans drinking from Caesar’s wounds is actually a good omen. Mark Penfold (Soothsayer, Caius Ligarius, Lepidus), Nick Sampson (Cinna), Hannah Stokely (Metellus Cimber), Rosie Edie (Marullus, Artemidorus) and Sid Sagar (Popilius Lena, Flavius) are all marvellous too, even if their parts are smaller. But it’s a real ensemble piece, which also comes across when you consider that instead of leaving the theater right after the performance, most actors stay in the foyer to have a drink together (or with friends). You can tell that the actors feel comfortable with each other and support each other. I guess that is another reason why this production feels so special to me. I just feel a quite strong connection to the cast, particularly those I’ve met, and have promised myself to watch out for future projects of the involved actors. I’ve already acted on this promise and bought a ticket for Kit Young’s next engagement at the Donmar Warehouse. To sum up, every play that I’m going to see from now on will have a lot to live up to. 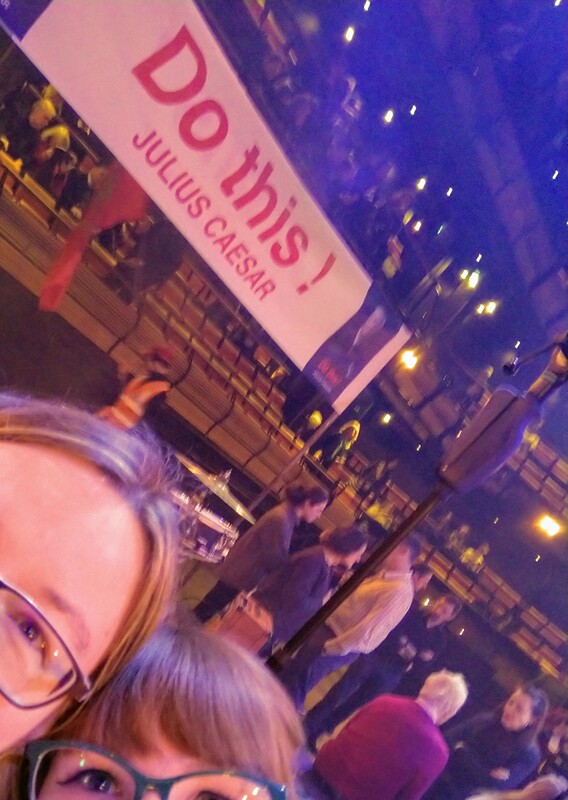 I certainly have no wish to see any other production of Julius Caesar, at least not any time soon, because I feel that Nicholas Hytner has managed to make me understand the play by letting me become a part of it as no other production – of Shakespeare or otherwise – has done so far. I have experienced Julius Caesar, not merely seen it. I’ve become part of the narrative if you like. It feels like this could be the future of theater – a type of theater that also young people can relate to. The matinee with the many kids was the best proof. Yes, in the beginning they had to be shushed a number of times, but seeing their faces – eyes and often mouths wide open – later on when „the action‟ had started, made me so happy. And what is the narrative, what is the message? To me, it is not a simple one. I’ve read elsewhere that Hytner’s production firmly stands on Brutus‘ side. To me, someone who hasn’t studied Shakespeare in detail (as a student I was more interested in contemporary literature, preferably from the US), the message of the play I’ve seen basically is: Be careful what you wish for. No one wants a tyrant, a dictator, but you should have a good plan if you want to change the leadership of your country. It won’t help if what follows after the removal of a (potential) dictator, is civil war and chaos. Plus, it doesn’t give a simple answer as to what is charismatic and what is populist. At least that’s how I felt. I felt touched by both Brutus‘ and Mark Antony’s speeches, which is confusing. Especially nowadays it seems like there is only black & white. You’re either for us or against us. What the other side says is evil and stupid. I didn’t feel that way in Julius Caesar – I could see both sides had their points. I mourned with both sides. I don’t know if that was the intention but that’s how it felt to me. If you still have the chance to see a recorded version of the NT LIVE broadcast, DO THIS! For example, at the Cinema München on April 16. Ich weiß. Hab auch immer weniger Lust, überhaupt was wegzuschneiden… Wer mich kennt, kann mich so oder so identifizieren.